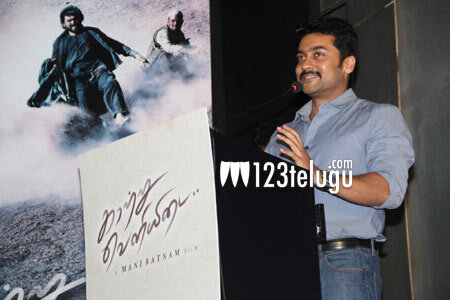 The Tamil audio of Mani Ratnam’s new film Cheliya was launched earlier today in Chennai and Suriya was the main guest of honor for this occasion. Speaking at the event, Suriya said that he was shocked to see Karthi’s transformation in the film. The superstar added that even though he was expecting a change of look for Karthi in Mani Ratnam’s film, the way Karthi looked, Suriya says he was shocked to see him when an image of a lean Karthi was sent to him on What’s App. Suirya finally ended by saying that Karthi has come a long way in his career from being an assistant director to Mani Ratnam and acting in his directorial venture and that too in a love story. Cheliya has Aditi Rao Hydari as the female lead and A R Rahman scores music for this film which is presented by Dil Raju in Telugu. The Telugu audio of the film will be launched tomorrow in Hyderabad.